It was a day etched in the memory of Class XII forever when they assembled for a farewell party hosted and conducted by the students of Class XI. The day was a fiesta devoted to the years spent together with friends and teachers to reminisce joyous moments. The program started with a welcome song, lighting of the lamp by the Principal and the Class Teachers of Class XII followed by Oath taking ceremony. Thereafter the students of Class XII lighted the sacred candle around the huge map of India depicted colorfully on the assembly ground. The venue was set ablaze with the cultural program in between followed with a ramp walk, self introduction, Talent and Question Round for Master and Miss APS Mathura Cantt. The pulsating music and scintillating dance performances rocked the ambience. The highlight of the event was the ever first ‘Citation Ceremony’, the thought processed by the honorable Principal. It was being given to every student of Class XII conveying them good wishes for their future. Somyabrata Sen from XII Sc. was adjudged Master APS Mathura and Vaishnavi Sharma from XII sc. was declared as Miss APS Mathura. Furthermore, many boys and girls of Class XII were given the titles like Most popular boy and girl, Computer Maestro, Miss Chulbuli, Mr Beans, Twinkle Toes etc. The program ended with the thanksgiving speech by the Head Boy and Girl of the institution and thereafter the blessings by the Principal. The Republic Day was celebrated with a lot of zeal & fervor. 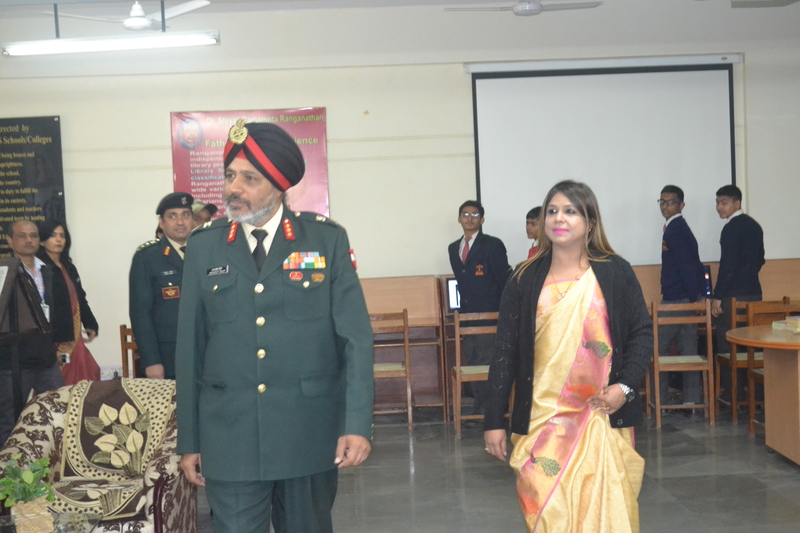 The Chief Guest of the event was Col. V.D. Chandola, SO to Chairman.The school choir presented melodious patriotic songs. Urvi Bhatia of ClassXI Sc delievered a speech elaborating upon the drastic progress our country has made after being republic.The Chief Guest put forward a word of advice to all the students. The programme ended with tree plantation. APS Mathura Cantt. fraternity bid farewell to the honorable Chairman, Brig D S Rawat on 19th Jan. His wisdom, knowledge and insight is truly reflected in the progress that APS Mathura has made under his able guidance. The Principal and Mrs Archana Jain (PGT Physics) elaborated upon the support & motivation that Sir had extended during his tenure. The institution wished him prosperity & good luck. It was indeed a magnum occasion on 18thJan’17 when Maj. Gen. V.D. Dogra, the Patron of the institution visited the school. The Principal made him aware of the comprehensive infrastructure, the staff, working environment & scenario of the institution. He was kind enough to extend his worthy advice for the betterment of the school. The school takes pride to witness the dynamic persona of the COS being reflected in the working of the institution.